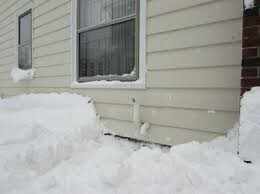 It is extremely important to make sure snow accumulation or snow drifts do not block exhaust vents for your clothes dryer, sidewall vents for your furnace and hot water heater or your chimney. Not doing so can have deadly consequences. A clothes dryer’s job is to remove the moisture from the freshly laundered clothes. Therefore, the moist hot air must be vented. 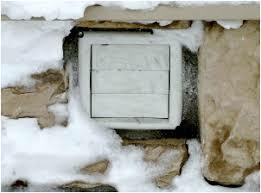 If the exterior vent is covered with snow and ice there will be a buildup of heat which could cause a fire. This is not different from a blockage caused by a bird nest or excessive buildup of lint. Dryer vents can be located anywhere on the exterior of your home or building. Advanced Furnace & Air Duct Cleaning has cleaned exterior vents located just inches from the ground or on the highest roof. Make sure snow is not blocking sidewall vents. Sidewall vents are common with the newer high efficiency heating units and hot water units. The vents include fresh air intakes which are often described as, “Breathing devices for these systems.” Vents that are free and clear of any blockage prevent the buildup of carbon monoxide. Also, condensate drain pipes that become blocked will cause the water to back up. The newer, high efficiency heating units have automatic shut offs and you will not have heat. Older units can shut down and/or cause flooding. 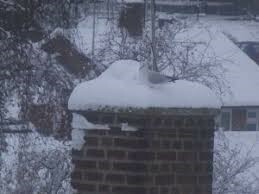 It is not uncommon for snow and ice to be covering a chimney. Never start a fire in a gas fireplace if the chimney is blocked. Air will not pass through as it should and once again, you are running the risk of dangerous carbon monoxide. Be extremely careful when going on a roof covered with snow and ice. More importantly, make sure you have working carbon monoxide monitors in your home, as well as your business. The monitor will warn you of a dangerous build up of CO and a heads up that you have a malfunctioning fuel burning device in your home. Common sources of CO include open flame appliances such as a furnace or hot water heater, space heaters, blocked chimneys even a car running too long inside your garage. Lastly, check on your neighbors after a heavy snow storm especially if they are elderly or disabled.